Wherever you travel, you're likely to see someone – or several someones – speaking into a cell phone or creating text messages. Electronic devices can be extremely useful, particularly for recording your travels and communicating with family and friends, but they come with a few drawbacks. You have to recharge them, for one thing, and you also need to be able to keep them safe. Let's take a closer look at traveling with electronic devices. Your electronic devices won't do you much good if you can't connect to the internet or a cell phone network. 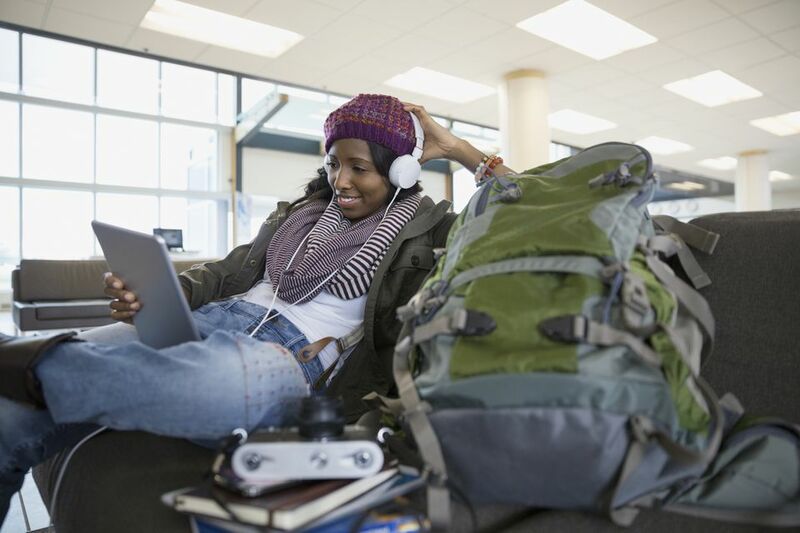 The best way to prepare for using your cell phone, tablet or laptop on your trip is to research connectivity before your departure date. If you plan to bring a laptop, check to see if free internet access is offered at your hotel or at a nearby location. Many hotels offer internet access for a daily fee. Find out what you will pay before you use this service. Wireless hot spots are an alternative to public internet access or hotel networks. Hot spots only make financial sense for frequent travelers because you must purchase the hot spot and subscribe to a monthly data plan. If you bring a hot spot with you, expect to pay extra for international coverage. Cell phone technology varies from country to country. Check your cell phone to see if it will work at your destination. If you own a "locked" US cell phone and plan to travel to Europe or Asia, you may wish to rent or buy a GSM cell phone to use on your trip. Whichever option you choose, do not send photos home via cell phone or stream video on your phone. Using too much data will drastically increase your cell phone bill. To save money, consider using Skype instead of your cell phone to make international telephone calls. If you decide to use free wireless internet access to keep in touch with family and friends, remember that any information you key in, such as passwords and account numbers, is not secure. Do not bank or shop online if you are using a free WiFi service. Your account information can be picked up by anyone nearby who has the proper equipment. Dealing with identity theft is even more difficult when you are away from home. Take steps to protect your personal information when you travel. Consider setting up a trip-only email address to use while you travel. You can send emails to friends and family without worrying that your main email account might be compromised. If you take a laptop computer through airport security in the US or Canada, you will need to take it out of its case and place it by itself in a plastic bin for X-ray screening unless you have TSA PreCheck. If this process is difficult for you, consider buying a TSA-friendly laptop case. This case unzips and allows security screeners to examine your computer. You cannot put anything else into that case. According to the TSA blog, small devices such as tablets and iPads can remain in your carry-on bag throughout the screening process. As you approach the screening checkpoint, slide your laptop along the X-ray scanner's conveyor belt. Put it away after you and it have been scanned, Do this before putting on your shoes and gathering your possessions. As you pass through the security checkpoint, take your time and be aware of the people around you. Keep an eye on your laptop and your purse or wallet, especially while you are putting on your belt, jacket and shoes. Thieves love to prey on distracted travelers. Some airlines, including Southwest Airlines, Delta Air Lines, United Airlines, American Airlines and Air Canada, offer internet access on some or all of their flights. In some cases, internet access is free, but many airlines charge for this service. Rates vary by flight length. Remember that, even at 39,000 feet, your personal information is not secure. Avoid entering passwords, credit card numbers and bank account numbers during your flight. You will eventually need to recharge your cell phone, tablet or laptop. Bring your charger on your trip, and remember to bring a plug adapter and / or a voltage converter if you are traveling overseas. Most charging cables only require plug adapters, not converters. Some airplanes have electrical outlets you can use, but you should not assume you will be allowed to recharge your electronic devices during your flight, especially if you are flying in economy class. If you are traveling by bus, you may be able to recharge your electronic devices during your trip. Greyhound, for example, offers electrical outlets on its buses. In the US, Amtrak trains typically provide electrical outlets. Canada's VIA Rail offers electrical outlets in Economy and Business Class on its Windsor-Québec City corridor trains and on the Canadian, Ocean, and Montréal - Gaspé lines. If you are not sure whether you will be able to easily recharge your cell phone or tablet, you can buy an emergency charger and bring it with you. Emergency chargers are either rechargeable or battery-powered. They can give you several hours of cell phone or tablet use. You must also consider the possibility that your cell phone or laptop may be stolen. Again, advance research will be well worth your time. Taking an expensive laptop or PDA to a region known for crime is asking for trouble. Of course, you may need to bring your electronic devices with you for work purposes or other important reasons. Take a few basic precautions in order to prevent theft. If your hotel has a room safe, you can lock your electronic items in it with reasonable confidence. Without a room safe or a reliable cable lock, you might not want to leave your laptop unattended. There are several software applications available that allow you to track your laptop's location and usage and let you delete sensitive information if the laptop is stolen. Cell phone tracking apps are available, too. Obtain a laptop case with nontraditional styling if you are visiting a region known for laptop theft. Thieves have been known to frequent airport terminals in order to grab laptops. While you are in the terminal, maintain physical contact with your laptop case as you wait for your flight. Back up your data before you travel in case the worst happens, and carry the telephone numbers of your cell phone service and Internet service providers in a separate place so you can contact them if any of your electronic devices are stolen. Carry your cell phone or PDA in a secure place. If you are traveling in a theft-prone area, do not keep your cell phone in your purse or clip it to your waistband. Carry it in an inside jacket pocket or inside a pocket or daypack that zips closed. Never leave your laptop, cell phone or PDA unattended in a public area, such as an airport recharging station. Unplug it and take it with you if you need to move around the terminal. Use common sense. If your travels take you to a dangerous part of the world, leave expensive electronics behind and find another way to stay in touch with your loved ones. Buy a cheap cell phone or use internet cafés. You can reconnect with everyone when you return home.